Store cards, just like credit cards, are the stuff of thieve's dreams. They provide free credit that they do not have to pay back because, of course, you get the bill and end up paying for their shopping spree. One danger with store cards is most still rely on the old signature method of authorising the payment, as opposed to the new chip and pin system in operation for most credit and debit cards. This means a fraudster can quite easily copy your signature and pay for items on your card if you were to lose it. If this is the case call the store and cancel the card at once. Also, with a bank statement for proof of name and address it could be possible to take out a card in your name. 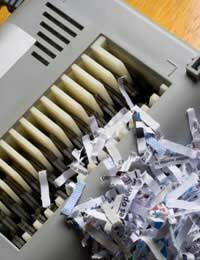 This is why it is crucial that you shred your personal documents or destroy them in another way before throwing them out so as to avoid identity fraud. However many consumers have complained that it is not just thieves and fraudsters who are making the cards ‘unsafe’ but the stores themselves. And one way they are doing so is by playing on the fraudsters angle. When you take out the card the store assistant may ask if you would like to take out protection insurance for the card at a regularly monthly fee. There have been cases reported where the consumer has shown interest in the protection insurance and asked for more details but been signed up automatically anyway and therefore forced to pay a protection fee for the card each month. Other examples of consumer complaints include being signed up for a card without authorising it. In some cases the application gets as far as the signature stage then for one reason or another the customer declines to continue and yet is signed up for the card anyway, without a signature. On top of this of course is the issue of the interest rate. Although not fraud it could be argued that consumers have been misled. Until May 2007 it was not necessary for the card provider to indicate what the rate of the card was in relation to other rates on the market. As of May 1st 2007 though store card providers must indicate what the interest rate is on the monthly statement. This may seem simple but the store assistant is unlikely to fully explain the interest rate and the implications of it when the card is taken out – which itself can be seen as a form of deception. And vulnerable customers are at risk. Always read the small print before signing up to any card or scheme and be sure to find out exactly what you have signed up to. If you are looking to take out a store card consider the interest rate and whether or not it would be more beneficial to get a credit card or, better still, none at all. Store cards have their uses but always be aware of the dangers too.